Old George Orwell got it backward. Big Brother isn’t watching. He’s singing and dancing. He’s pulling rabbits out of a hat. Big Brother’s busy holding your attention every moment you’re awake. He’s making sure you’re always distracted. He’s making sure you’re fully absorbed. He’s making sure your imagination withers. And this being fed, it’s worse than being watched. It’s time to take a good look inward, I think. The above quote sits heavy at the bottom of every email that I send out from my personal yahoo account. I’m a big Palahniuk fan and when I read that quote, I knew it was gonna be my new email signature, letting everyone know just how counter-culture I am! While I do believe that I’m less sucked in than most of the country, and that I know what’s “really important” and that I can “give it up whenever I WANT TO! !”, I’m just as much of a slave to the distraction as everyone else is. Hell, I started a Podcast and a blog this week to ADD to said distraction. But AM I? What is the distraction, do you think? Is it actually the comic books, scripted television shows and music that comes at me from every direction, that I so willingly allow myself to absorb? OR is it the corrupt media that shields us from what’s really going on in the world? Should I be just as ashamed for filling my head with the stories of super-heroes and horror monsters, as people who get their news from network television and believe anything they see in print? Am I just as much a part of The Decline as the people I hold in contempt? I may be. 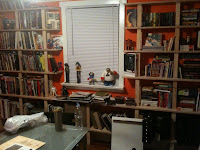 As I look around from where I’m sitting, typing this stream-of-consciousness, I see a pile of comics on my bedstand, graphic novels on my pillows, an iPhone, my computer, filled with bookmarked popculture websites, and I can see my shelves in the dining room just FILLED to the brim with comics, novels, cds, movies, and toys. My god, man. TOYS. Sorry, not toys. FIGURES. We all know by now that they are Action Figures, not Toys. Pfft. But then I start to look a little closer. And I see that The Guardian UK website is in my bookmarks. WXPN. Things I don’t hit every day, but they’re there. I see that the two graphic novels on the pillows are Persepolis by Marjane Satrapi, the story contained within hopefully to teach me about Iran and the Islamic Revolution, something I have little to NO knowledge of at all. I see I KILL GIANTS, a graphic novel that literally made me cry my own tears, that taught me something about loss and dealing with the mortality of those I love. There’s a bookshelf made totally up of how-to books. 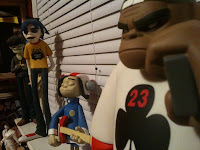 I see the oversized vinyl GORILLAZ figures that originated from one of my favorite illustrators, Jamie Hewlett, someone who I consider to have perfected his art years ago, yet keeps getting better and expanding his abilities, which reminds me to do the same. All of these things are inspirata. They are teaching tools and artifacts of creativity. I have a thirst for knowledge and growth and these are the stories I inhabit to gain something of worth. Is it a distraction? Am I allowing myself to be distracted? Yes. But I like to think it’s something else as well.